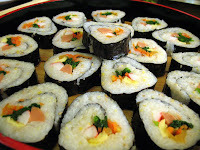 Korea Information Blog: Kim Bap - Not a Japanese sushi~!!!! What is it??? HINT: THIS IS NOT A SUSHI... !!! I don't like people who think this is the same as Japanese sushi.....WRONG!!! I'll remind you again.. This is Kim-Bap... one of Korean's favorite food!!! undefined!? June 12, 2009 at 10:21 a.m.